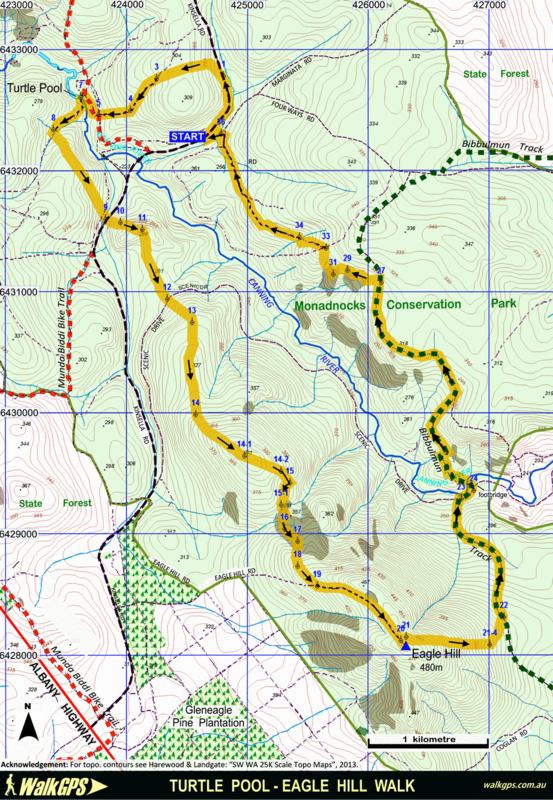 This walk within the Monadnocks Conservation Park crosses the WalkGPS Eagle Hill (Gleneagle) walk route at two points but the two walks are otherwise quite different. 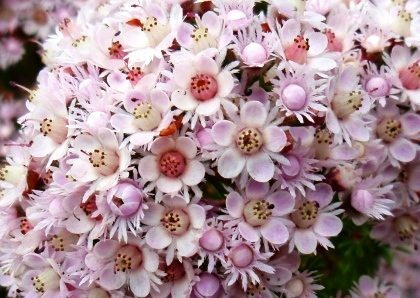 Also for those who prefer less off-track walking, this is the preferred walk for you; an excellent uncomplicated route which includes a combination of old disused forestry tracks, an old logging railway formation, 3.5km of the Bibbulmun Track, and about 7km of off-track walking. 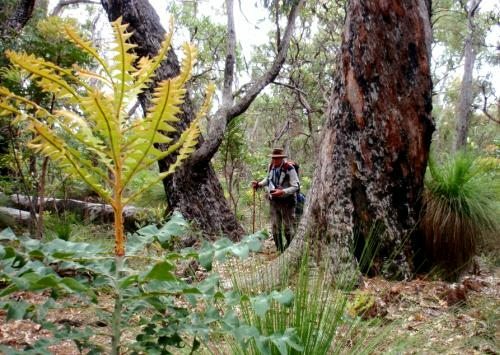 A climb along the NW ridge of Eagle Hill passes through some fine, mature jarrah forest. 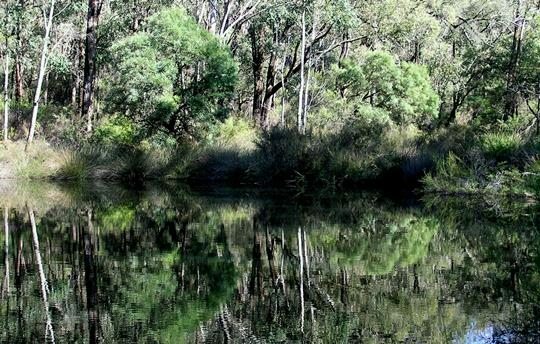 Turtle Pool and the Bibbulmun Track crossing of the Canning River are both pleasant spots to linger along the way. This walk route lies within the Monadnocks National Park. 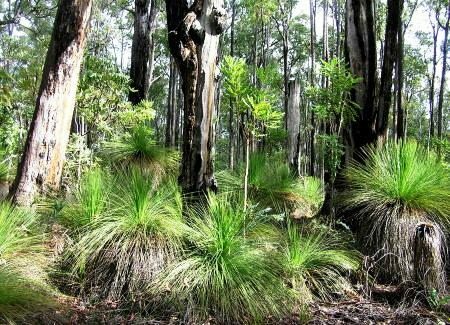 This is an excellent uncomplicated walk route which includes a combination of old disused forestry tracks, 3.5km of the Bibbulmun Track, and about 7.5km of off-track walking. The walk features an initial visit to Turtle Pool on the Canning River. 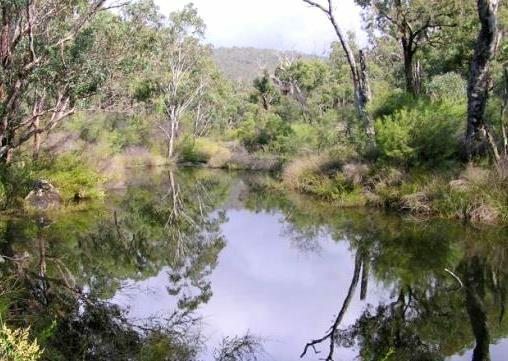 (Turtle Pool is associated with the Waugal – the mythological Rainbow Serpent of the Noongars- and the Canning River in general is recognised as being of significance to Noongars.) There is then a steady, mainly gentle, off-track climb to the broad NW ridge of Eagle Hill. Along the ridge the route passes through some fine, mature jarrah forest then descends to a large granite outcrop before the final climb to the summit area of Eagle Hill (elevation approx. 480m). 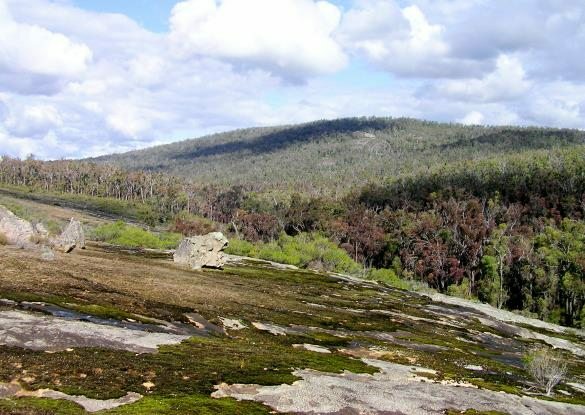 Although views from the summit itself are blocked by a thicket of parrot bush, a small outcrop close by on the NE flank provides an excellent view to distant Mount Dale. After descending the eastern flank of Eagle Hill, the route then joins the Bibbulmun Track and follows the Track north, crossing the Canning River by a footbridge. About 2km north of the River, the route heads off-track again to soon cross a large outcrop with views back southward to Eagle Hill. Soon after the outcrop a pleasant disused forestry track leads back to the Start point. 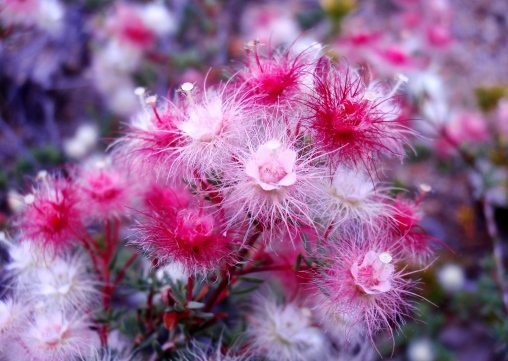 The off-track walking is mainly through open jarrah and marri forest with some sheoak and banksia, plus a very short possibly scratchy section of tall shrubs bordering the northern outcrop. The walk route crosses the Eagle Hill (Gleneagle) walk route at two points but the two walks are otherwise quite different. For those seeking a more challenging route, including more off-track walking, the Eagle Hill route should be your first choice. For overnighters: For those keen to camp overnight in the area: The Canning Campsite (which includes a 3-sided shelter) on the Bibbulmun Track can be reached by staying on the Track for a further 5km after reaching waypoint ’27’ on the walk route. To finish the walk next morning you can stay on Four Ways Road, which diverts off the Bibbulmun Track and meets Marginata Road (forestry track), about 500m from the start point. See Nearest campsite/s below for more info. Head NE up Kinsella Road from the Start point (at waypoint ‘START’). At ‘1’ leave the Road to follow an old overgrown forestry track gently uphill. After about 150m (at ‘2’), veer left to head WSW uphill and off-track through open forest. After crossing the flat crestal area of the hill meet another old forestry road (at ‘3’) and turn left to follow it SW-ward downhill. The old road soon veers more westward (at ‘4’) and then meets the Munda Biddi Bike Trail (at ‘5’). Follow the Trail northward and when it veers off to the right continue on the old forestry track to ‘6’. Then turn left to descend to the nearby Canning River and upstream end of Turtle Pool. Turtle Pool is a pleasant spot for a short break. Cross the River at the old ford at ‘7’ to reach the old vehicle track on the western bank. (Or see Option below, to follow in the unlikely event that Canning River is flowing too strongly to safely cross.) Follow the partly overgrown track SW-ward, gently uphill along a side valley. At ‘8’ turn left to cross the stream course and climb SE-ward up the hillside to ‘8-1’. Follow the flatter edge of the hill top for about 200m before descending SW-ward via ‘8-2’ to cross a narrow gully at ‘8-3’ and scramble up to Kinsella Rd. Cross the road at ‘9’ and head up the steep rocky slope into the forest via ‘10’. Reach a small hilltop at ‘11’. Veer sharp right to head southward downslope to a broad, flat saddle area, passing a large boulder at ‘11-1’. Cross Scenic Drive at ‘12’ near where the old railway formation passed through a small cutting in the hillside. Climb the ridge quite steeply (still off-track) through open forest and when the slope eases, at ’13’ veer southward to continue more gently uphill along the ridge. 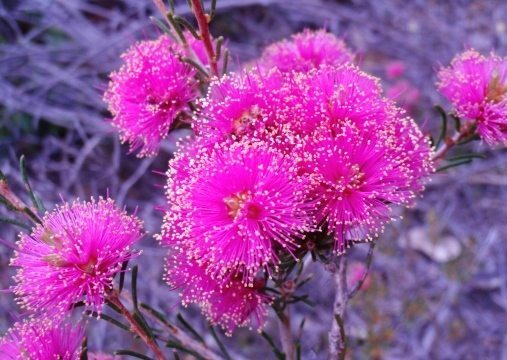 This section of the walk passes through some excellent mature jarrah forest and mixed jarrah-banksia-sheoak forest. At ’14’ veer SE again to stay on the ridge. 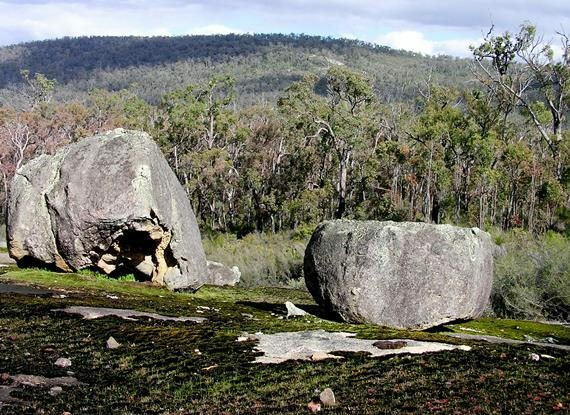 Cross the flattish summit area of the hilltop (at ’14-1′) then descend ESE-ward downflank via ‘14-2’ and reach a cluster of impressive, large granite boulders (or ‘tors’) at ‘15’. 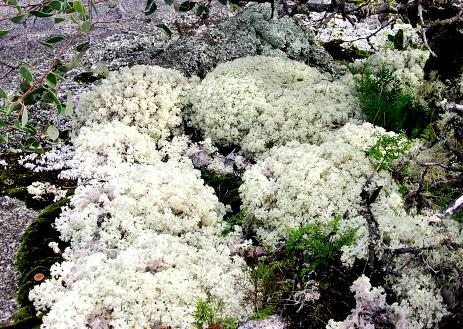 Turn right to pass below the high downhill face of the most prominent of the boulders and head along slope through the forest to ’15-1′ where shrubland fringes a granite outcrop in a saddle area. Cross the outcrop and then a small stream gully (at ‘15-2’) to another larger outcrop (at ’16’) which rises SE. Walk up the slope of the outcrop to ’17’ which is a pleasant spot to stop for a break and is not far from the halfway mark on the walk. There are pleasant views from here, including westward toward the Chandler Hills area. Re-enter the forest at the southern upslope limit of the outcrop (at ’17-1′), then climb southward through the forest to soon reach the crest of the main Eagle Hill ridge at ‘18’. After reaching the ridge, walk SE along slope to soon meet Eagle Hill Road (old forestry vehicle track; at’19’). Follow Eagle Hill Road initially eastward uphill; the Road soon veers SE and flattens as it approaches the summit area of Eagle Hill. 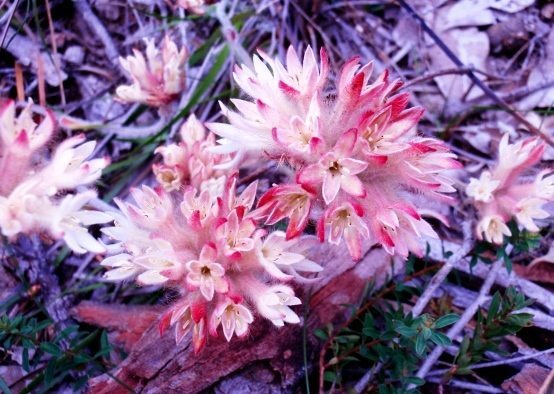 (Note: Views from the actual summit area beyond the end of the old vehicle track are limited by thickets of parrot bush/Dryandra). At ’20’, before reaching the end of Eagle Hill Road, turn left off-track down the NE-flank for less than 50m to reach a small granite outcrop at ‘21’. This provides a good view to Mount Dale, 18km NE. Then head eastward, initially along slope to ‘21-1’, then increasingly steeply downslope via ‘21-2’ and ‘21-3’. At ’21-4′ veer NNE-ward and more gently downhill to meet the Bibbulmun Track (at ’22’). Turn left to follow the Track northward and continuing gently downhill for about 1km to meet Scenic Drive at ‘23’ close to the southern bank of the Canning River. Follow the Track right, along Scenic Drive, with nice views of the Canning River. After about 200m the Track veers left at ’24’ to leave Scenic Drive and cross Canning River by a footbridge at ‘25’. 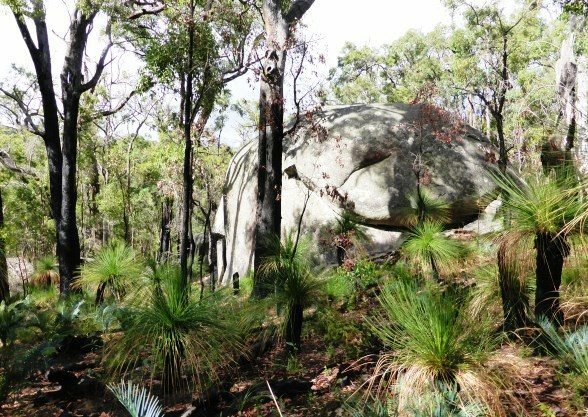 Continue on the Track (via ‘26’) for about 2km as it continues NNW initially uphill and around a granite outcrop, then flattens out in the jarrah forest. At ’27’ turn left to leave the Track and head westward off-track and gently downhill to soon reach a granite outcrop (at ’28’). Continue WNW along the outcrop via ‘28-1’ and at ‘29’ pick your way (using animal tracks) through a narrow belt of quite dense tall shrubland to reach a continuation of the outcrop (at ’30’). 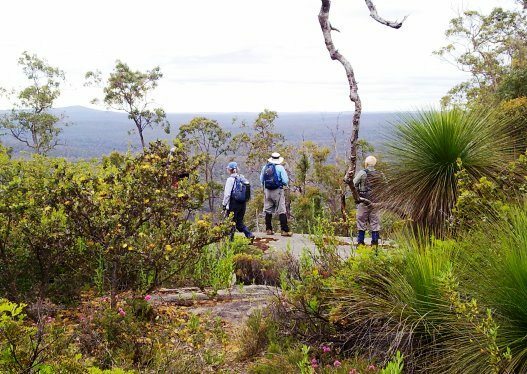 As soon as you get clear of the shrubs, head downslope (SW) for less than 100m onto the open slopes of the outcrop at ‘31’, gaining a good view southward back across Canning River valley to Eagle Hill. Then head NW along the slope of the outcrop to re-enter the forest. Cross a small gully at ‘32’, then head northward gently uphill for about 150m to reach a Y-junction (at ’33’) between two old disused forestry tracks (partly overgrown and indistinct). Ignore the most obvious ‘through road’ that heads SW-ward and instead follow the initially less distinct one that heads WNW. This old vehicle track soon descends to cross a small gully where it becomes quite overgrown with tall shrubs for a short distance. Bypass the overgrown section by veering into forest to the left at ‘33-1’ and then right again at ‘33-2’ to rejoin the vehicle track on the western side of the gully. The track now mostly follows an old logging railway formation. Follow it around the hillside for about 1km. It veers NW-ward and then gently downhill. At ’35’ turn left to follow a short connector road downhill to meet Marginata Road (dirt road; at ’36’). Turn left again and follow Marginata Road for 100m back to the Start point near the corner with Kinsella Road. Option to avoid Canning River crossing at ‘7’: From ‘6’, near Turtle Pool, retrace your steps back to ‘5’ and continue initially southward and then eastward along the Munda Biddi Bike Trail to reach Kinsella Road. Turn right onto Kinsella Road, to cross the Canning River, and follow the road south for about 500m to ‘9’ to rejoin the described walk route. Turn left off Albany Hwy into Kinsella Road (gravelled surface) which is about 250m before the Gleneagle Rest area. After 5km, Kinsella Road crosses Canning River. Continue for 500m to the Marginata Road turn-off on the right. Park at at the ‘START’ point at the side of Marginata Road just after the turn-off and before the No Entry sign. Canning Campsite: 5km on Bibbulmun Track, northeast of waypoint ‘27’. 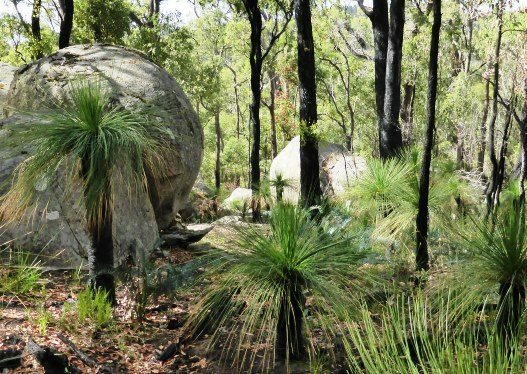 Monadnocks Campsite: 5.5km on Bibbulmun Track, southward of waypoint ‘22’. Kinsella Road in west; Bibbulmun Track in east. South of the Canning River, Scenic Drive (forestry road) connects Bibbulmun Track to Kinsella Road. Eagle Hill Road (disused and partly overgrown old vehicle track) runs from Eagle Hill summit to Kinsella Road, passing the northern edge of Gleneagle Pine Plantation. “Monadnocks Conservation Park”, DBCA site – Unfortunately this provides no significant information and no management plan appears to exist for the Park as yet. “South West WA 25K Scale Topo Maps”, Greg Harewood & Landgate, 2015. – Digital raster; ECW format on 16GB USB. See tiles # 301-2133-III-NE and # 315-2133-IV-SE for relevant map coverage. Water catchment access: Walkers need to be aware that this walk area and many others on WalkGPS lie within drinking water catchment areas. 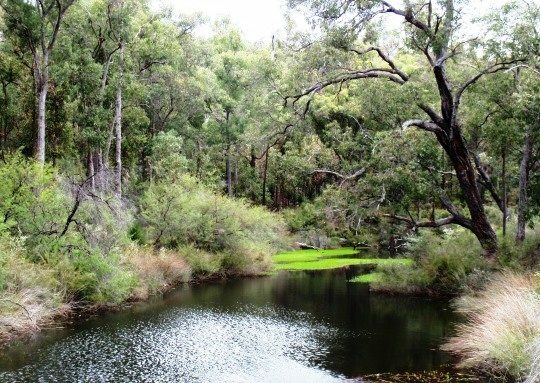 This walk does not enter a limited access Reservoir Protection Zone and is located more than 6km SSE of Canning Reservoir; But in 2007 DoW in effect recommended a prohibition of all traditional off-track bushwalking activities across the entire Perth region catchment areas covering 4500 sq km, far beyond the limits of existing or proposed Reservoir Protection Zones. By March 2008, the DoW had been persuaded to reconsider its published position. 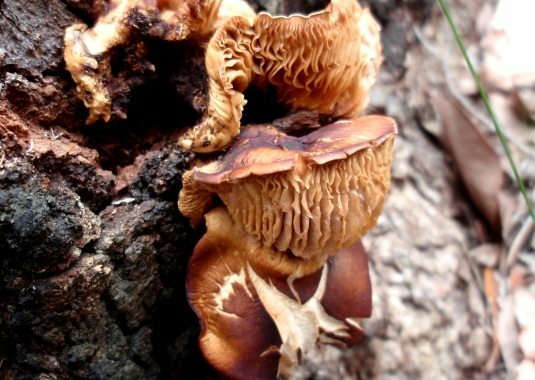 The Policy of 2012 refrains from banning traditional bushwalking in the outer catchments. The community, including visitors to WalkGPS, need to remain vigilant to ensure that commonsense continues to prevail over regulatory zealotry. See also Water catchments on WalkGPS and DoW’s “Canning River Catchment Area Drinking Water Source Protection Plan” of 2007. Canning River, downstream view below Bibbulmun Track bridge. Canning River, upstream view from Bibbulmun Track bridge. 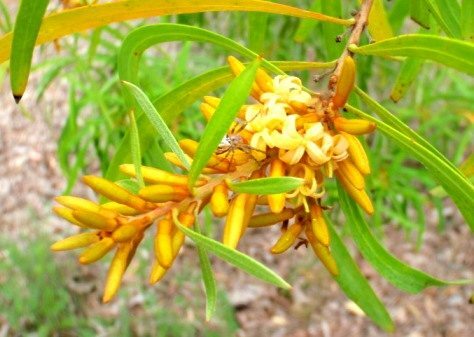 Snottygobble tree in flower (Persoonia longifolia). 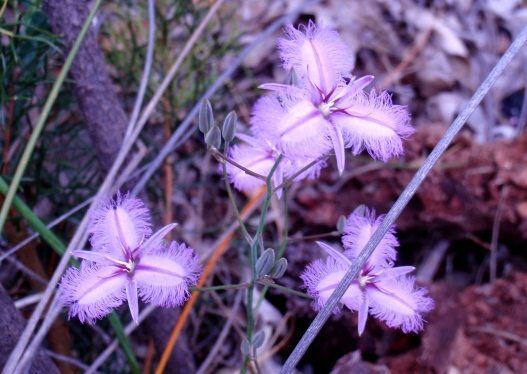 Climbing Fringe Lily (Thysanotus patersonii). 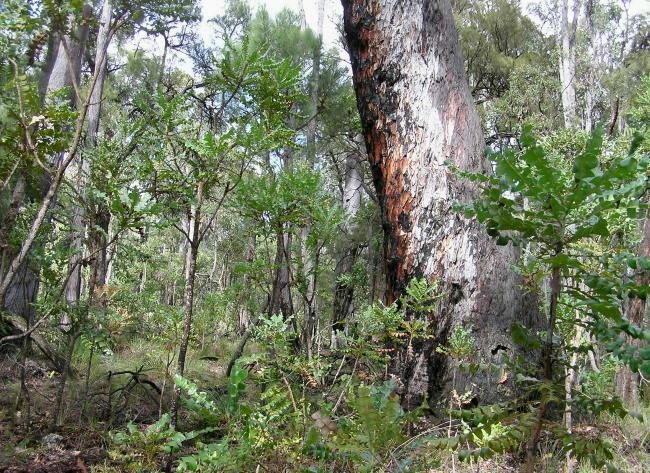 Mixed jarrah-banksia forest on ridge NW of Eagle Hill. Jarrah forest and balgas, on ridge NW of Eagle Hill. Large granite boulder (or 'tor') on flank of NW ridge. Cluster of boulders on flank of NW ridge. View 2.5km south to Eagle Hill from outcrop in north. View south to Eagle Hill. Walkers enjoy view to Mount Dale (18km) from near summit of Eagle Hill.